The oldest amniotes are Hylonomus and Paleothyris from the mid-Carboniferous (310 and 300 Myr ago, respectively) of Nova Scotia (Carroll, 1964, 1969a). The body (Figure 5.1(a)) is slender, and is about 200mm long, including the tail. Unlike many basal tetrapods, the head is relatively small, being about one-fifth of the trunk length rather than one-third to one-quarter. The skull of Hylonomus is incompletely known, with uncertainty about the posterior view and the palate, but Paleothyris is represented by better skull remains (Figure 5.1(b-f)). The tetrapod skull consists of a thin outer covering of dermal roofing bones with a modest-sized braincase, loosely attached, inside. The outer covering is perforated by two large orbits and two nostrils. 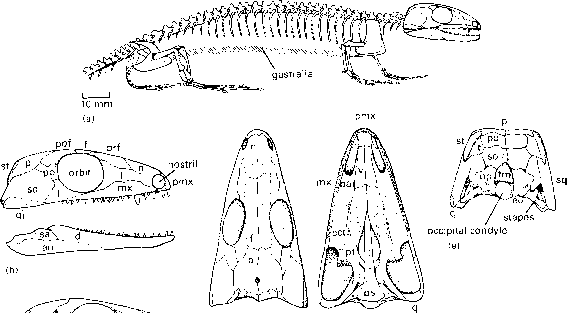 The array of bones in the skull of Paleothyris is similar to that of advanced reptiliomorphs (cf. Figure 4.18), but it has no otic notch, and the bones at the back of the skull table (supratemporal, tabular, postparietal) are very much reduced and seen mainly in the posterior view of the skull on the occiput (Figure 5.1(e)). The skull and jaw bones may be divided into five main sets, which relate to the following standard views. 1 Cheek (Figure 5.1(b)): from the front, the side of the skull shows the following bones: premaxilla and maxilla,both bearing teeth, lacrimal and prefrontal in front of the orbit, and postfrontal, postorbital and jugal behind. The squamosal, quadratojugal and quadrate make up the posterior angles of the skull. 2 Skull table (Figure 5.1(c)): paired nasals, frontals and parietals form the dorsal surface of the skull, with the nasals lying between the nostrils, and the frontals between the orbits. 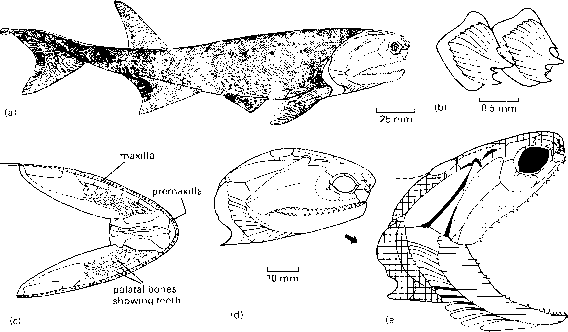 Many early tetrapods have a large parietal foramen lying in the midline between the parietals (e.g. Figures 5.1(c), 5.6(c), 5.8(e)), a feature that was lost in most Mesozoic descendants. This foramen is often associated with the 'pineal organ', a part of the brain that serves a light-detecting function in some vertebrates. 3 Palate (Figure 5.1(d)): paired vomers lie behind the palatal portions of the premaxillae, and behind them the pterygoids, which run back and sideways to meet the quadrates. The pterygoids are attached to the maxillae and jugals at the side by the palatines and ectoptery-goids. The main ventral element of the braincase, the parasphenoid, lies behind and between the pterygoids, and it sends a long process forwards in the midline in the interpterygoid vacuity. Several of the palatal bones (palatine, pterygoid, parasphenoid) bear teeth, and these teeth tend to be lost in the course of amniote evolution. 4 Occiput (Figure 5.1(e)): the view of the back of the skull shows how the braincase fits inside the cranium: the postparietals, tabulars and supratemporals ofthe skull table form the dorsal margin and are attached to the supraoccipital, the dorsal braincase element. The other elements of the braincase, the opisthotics and ex-occipitals, support the semicircular canals of the inner ear, and the exoccipitals lie on either side of the foramen magnum, the broad passage through which the spinal cord passes back from the brain. The opisthotic also runs sideways towards the squamosal, quadratojugal, and quadrate of the cheek region, and a robust stapes makes a link to the quadrate. The lower margin of the braincase is formed by the basioccipital, which also provides a ball-like occipital condyle that articulates with the first vertebra in the neck. 5 Lower jaw (mandible) (Figure 5.1(b, g)): the main lower jaw element in lateral (outside) view (Figure 5.1(b)) is the dentary at the front that bears the teeth. Behind it are the surangular above and the angular below. In medial (inside) view (Figure 5.1(g)), it can be seen that the angular wraps round under the jaw, and the main bones are the splenial in front and the prearticular behind, with a small coronoid between and forming a peak in the jaw margin. The jaw joint lies on the articular bone, a small complex element at the back. The skeleton of Hylonomus (Figure 5.1(a)) and Paleothyris is lightly built. The vertebrae consist of spool-like pleurocentra with small crescent-shaped intercentra between. The first two cervical vertebrae (Figure 5.2(a)), the vertebrae of the neck, are highly modified to make the junction with the occipital condyle of the skull. Vertebra 1, the atlas,consists of six separate elements, the intercentrum,which fits beneath the occipital condyle, the pleurocentrum behind it, and a proatlas and atlas arch on each side above the occipital condyle. Vertebra 2, the axis, is a large element with the pleurocentrum and neural arch fused to each other, and a small intercentrum in front. The atlas accommodates the ball-like occipital condyle of the skull and allows rotary movements of the head, whereas the atlas is locked in place and permits broadly up-and-down movements. The remaining three or four cervical vertebrae follow a similar pattern, but they have rather smaller neural arches than the axis. The dorsal vertebrae, those lying in the trunk region, number about 21 in Hylonomus and 27 in Paleothyris, making a total of about 32 presacral vertebrae (cervi-cals + dorsals) respectively. The cervicals bear short ribs, whereas the dorsal ribs are longer and form a rib cage. Behind the presacral vertebrae are two sacrals in the hip region that are attached to the ilia by specialized ribs, and then an unknown, but large, number of caudal vertebrae in the tail. long T-shaped element beneath. The arm is short (Figure 5.1(a)), and the hand (Figure 5.2(c)) long and slender. It shows all the wrist bones seen in Eryops (Figure 4.1b), and the phalangeal formula of the hand is 2,3,4,5,3—a typical value for anthracosaurs and amniotes. The pelvis (Figure 5.2(d)) consists ofa narrow ilium, and a heavy pubis and ischium beneath, which meet each other in the midline as in basal tetrapods (cf. Figure 4.6(d)). The hindlimb and foot are longer than the forelimb and hand. The ankle bones have changed in one respect from those of Acanthostega (Figure 4.6(f)), apart from becoming more slender. 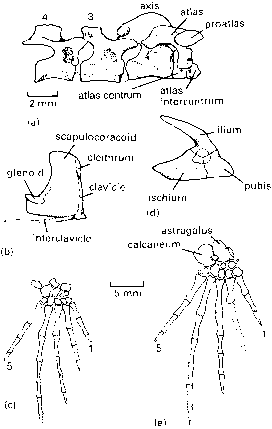 The tibiale, intermedium and a centrale of basal tetrapods have fused into a larger element termed the astragalus. The fibulare is also larger, and is termed the calcaneum. The phalangeal formula of the foot is 2,3,4,5,3. There are no bony scales in the skin of Hylonomus or Paleothyris, but these animals have chevron-like gas-tralia, or abdominal 'ribs', closely spaced in the belly region (Figure 5.1(a)). The light construction of the skull, and the small sharp teeth, suggest that Hylonomus and Paleothyris fed on invertebrates such as insects and millepedes. The teeth could readily pierce the tough cuticle to reach the flesh inside. One of the key features of the skull of Paleothyris that relates to feeding is an increase in the strength of the jaws when compared with basal tetrapods, sufficient to nip through the toughest arthropod cuticle. A major muscle group, the pterygoideus, supplements the adductors in pulling the jaw up and forwards (Figure 5.1(g)). The palatal teeth in Paleothyris are smaller than those on the premaxilla and maxilla, and they presumably played a less important role, probably in holding the food and in further crushing it after it had been cut up. The tongue was probably toughened on its upper surface, and worked against the palatal teeth. The stapes in Paleothyris is heavy, as in the basal tetrapods, and it probably had a limited function in hearing. Low-frequency sounds could be transmitted as vibrations from the throat region through the stapes to the braincase. It is unlikely that Paleothyris had a tympanum as there is no otic notch. Restorations of the life appearance of Hylonomus and Paleothyris (Figure 5.3) show that they probably looked like modern terrestrial insectivorous lizards. Both are lightly-built, so it is remarkable how well their remains have been fossilized. 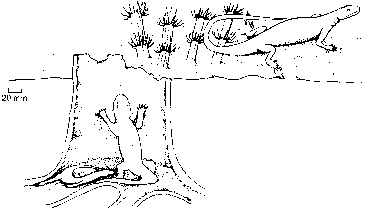 This is explicable because of the unique conditions of preservation: both Hylono-mus and Paleothyris have been found in fossilized tree trunks. Hylonomus comes from mudstones, sandstones and coals, deposited in shallow freshwater lakes and rivers of the Cumberland Group of Joggins, Nova Scotia (Carroll, 1970). In the 1840s geologists discovered abundant upright tree stumps of the lycopod (club moss) tree Sigillaria. The first fossil vertebrates were collected there in 1852, and since then over 30 productive tree stumps have been discovered, and the contained bones removed for study. The total haul included skeletons of hundreds of basal tetrapods (six species of microsaurs, one temnospondyl, and one anthracosaur) as well as two amniote species, Hylonomus and the basal synapsid, Protoclepsydrops. It seems that in mid-Carboniferous times the Jog-gins area was covered with lush forests of Sigillaria, up to 30 m tall. Occasionally, the lakes flooded and the forests were inundated with sediment. The trees died and fell, leaving only their roots and buried lower trunks in place. As new forests became established above, the centres of the lycopod tree trunks rotted, and millepedes, snails and small tetrapods crawled in seeking food or shelter (Figure 5.3). These animals lived for some time in the tree trunks as the tetrapods fed on the invertebrates and left faecal remains, but eventually they died or were inundated by further floods. The bottoms of the tree trunks then provide a concentration of the small terrestrial animals of the time.